I am always surprised at the reaction I get when people discover that I almost always travel (at home and abroad) alone. 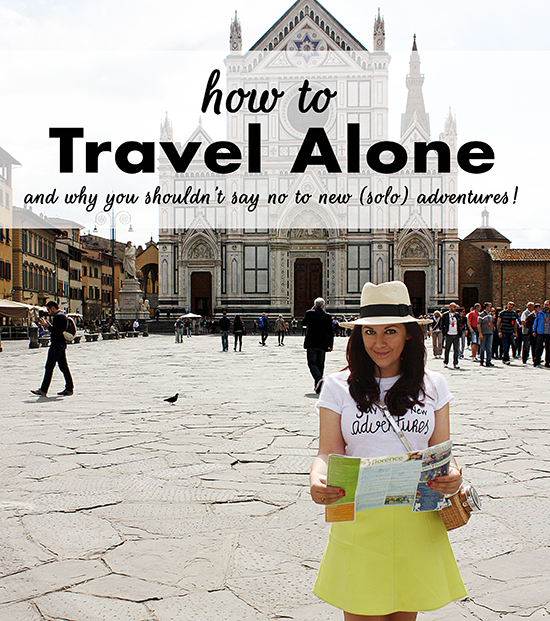 I usually hear things like, "aren't you afraid to travel by yourself as a single woman?" or "you're ok eating dinner alone?" I think it's interesting that in our society it is completely normal for men to travel alone frequently and typically for work, while I, however, get looks of pity, as if my life is so sad because I travel alone! Well, I have been to England, Germany, Spain, and Turkey by myself and I've got to tell you, I had an incredible time! If you are going to have pity, have pity on the women who don't adventure on their own because we allow are society to tell them it's unsafe or sad. Research, research, research! I always study the map and research the city (or cities) I am traveling to. I make sure I arrive in the morning (or at least during daylight hours) and that I am familiar with the public transportation system(s), or have arranged transport to my hotel. I also take extra care to understand the layout of the city and where the safer neighborhoods are. In my opinion it is worth paying more for a safe hotel in a good neighborhood when traveling by yourself. Also, by staying in a more reputable hotel you can get to know the hotel staff who can be very helpful and accommodating. Safety should come first. There are just some things you shouldn't do when traveling by yourself (especially abroad). And one of those is partying all night. If that's the type of trip you are looking for, you should really go with friends. But if you are looking to learn and explore a new culture, there is nothing better than immersing yourself, by yourself. Capitalize on daylight hours. I get up early and see as much as I can before sunset. If I want to go out after dark (which I rarely do) I always splurge for the taxi. Typically though I spend my evenings socializing at the hotel, or relaxing in my room (I love to explore new cities on foot, so I am usually too tired at night). One final note on safety - always be cautious of who you befriend and what you tell them. I rarely reveal I am traveling alone. When asked, I usually joke that my fiends are party animals and I just want to visit the museums. Be confident. Because I research before I depart I already know what to expect and how to get around. Having that kind of confidence will make you less of a target. If you look competent and like you know what you are doing, no one will bother you! Trust your instincts (I call this my gut). I always trust my gut when traveling, even if my reaction seems irrational. If I feel uncomfortable at anytime, I remove myself from the situation. Your gut, however, is much more reliable when you make the effort to constantly be aware of your surroundings. For example, one evening in Florence I was stuck walking home alone after dark and through a not-so-nice part of town. I noticed there was a guy following me. Now, he could have been simply heading the same direction, but my gut told me to be careful. I knew there was a 24-hour McDonalds around the corner and I ducked inside until he was well out of sight. Another trick I love if someone is harassing you, simple walk up to a group of tourist and act like you belong! Of course there are times when I travel that I get lonely, frustrated, or worried, but I highly doubt these are emotions only solo travelers feel. The reality is that there are rarely like-mided people with the same means and schedule as you to travel. I am lucky enough to live abroad in the summer. None of my friends or family can afford to do that, so I have embraced solo travel. I love being able to explore as many churches, museums, and historical sites as I want, eat when I want and where I want, and sleep and relax without worrying about anyone else! Don't let the fear of being alone keep you from seeing the world! Oh and p.s. that whole "omg you eat alone" thing - if you are really that concerned about it you can book a local dinner tour/show, eat at a bar, or if you are really worried, order room service! There is always an alternative! Would you travel alone? Where would you go first?